KH-8 or Gambit-3 was the second generation of Gambit high resolution reconnaissance satellites. 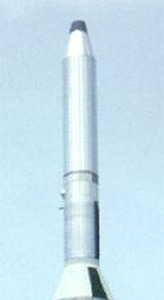 The KH-8 Block 1 were the initial iteration of this design. KH-8 introduced a new camera system and reverted back to the Agena-D flight control stage instead of the OCV of its predecessor. The forward part was joint via a roll joint with the Agena-D. The major subsystems of the satellite included a photographic-payload section (PPS), a satellite-control section (SCS), and the booster vehicle. The payload section contained a camera module and a satellite recovery-vehicle (SRV). The control section included the command system, the orbit-adjust module, an attitude-control subsystem, a back-up stabilization system (BUSS), and the power supply. The camera system was strip camera coupled to an optical system a focal length of 4.46 m. In the optical system the ground image is reflected by a steerable flat mirror to a 1.21 m diameter stationary concave primary mirror. The primary mirror reflects the light through an opening in the flat mirror and through a Ross corrector. At perigeum, the main camera imaged a 6.3 km wide ground swath on a 223.8 mm wide moving portion of film through a small slit aperture. The ground resolution was as small as 0.1 m or better, near the theoretical physical e resolution limit imposed by atmospheric turbulence. The first 22 satellites, called KH-8 Block 1, featured only one SRV. The sixth mission was the first flight of the stellar index camera. Beginning with the 12th vehicle, an improved roll joint was installed. Due to the higher launch mass, the KH-8 were launched by Titan-3B Agena-D rockets instead of Atlas Agenas. KH-8 5 failed to reach orbit. On KH-8 11, the parachute of the SRV capsule failed. KH-8 18 and KH-8 19 had a too high apogees, as the Agena-D failed to switch off at the correct time. The KH-8 Block-1 satellites were succeeded by the improved KH-8 Block 2 satellites featuring two SRVs.